BUENOS AIRES (FIBA World Championship 2006) - Try telling Manu Ginobili that size doesn't matter because for 17 years, at times it seemed he cared about nothing else. The Argentinian international laughs about it now, but as a kid his obsession with his height often brought him to tears. "When he was young, Manu would measure his height on the kitchen door every single day," recalls Manu's father, Jorge Ginobili, in Italian weekly Sportweek. "Those marks are still there today. "He would always get upset, worried and would close himself in his room because he would never reach the height of his elder brothers." But at 17, Manu's prayers were finally answered. "He had a late growth spurt and only then did he grow by almost 20cm," Jorge said. "Before, he was a small kid." 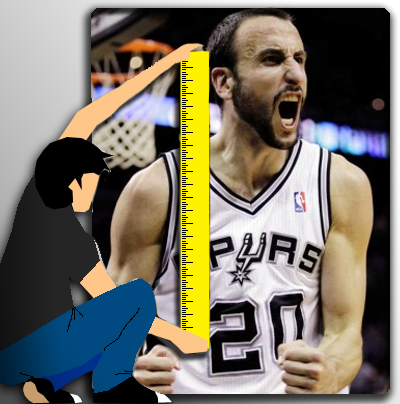 Manu Ginobili believed it was important to be tall in basketball, which is widely accepted as a sport of giants. "I was one of the smallest players in all the teams I played for and I worried," said Manu, who is now stands 6ft 6in. "Height in basketball may not be everything but it's the key to triumph. At times, I thought that I wouldn't be tall enough for this sport but then I thought to myself that I could do something else in life." Hoops in Manu's home town of Bahia Blanca is a religion. "Basketball is felt at a different level here to anywhere else," admitted Manu. "For a long time, it was the number one sport ahead of soccer." And in the Ginobili household more so, with Jorge the vice-president of regional basketball club Bahiense del Norte. "I've been here almost 50 years," Jorge said. "All my three boys have started to play basketball at this club and Manu played here until he was 16." It was his father's passion for the game that helped Manu overcome the early adversity. "My father has had a major impact because he has transmitted us the love for basketball, a feeling that to this day is deep inside us," he said. And yet Jorge didn't picture his younger son's future on the hardwood. "I wanted my son to finish his studies and to find a job as an accountant, seeing as he loved numbers and mathematics," he said. "He was a very good student. "At 18, he finished school and he went to play at club Andino and thus, he didn't go to university. "Then at 21, when he got an offer from Italy (Viola Reggio Calabria), we realised then that he was going to be a professional basketball player." Little did Jorge know that his son would go on to become a star for club and country, winning titles in Italy with Virtus Bologna, two NBA rings with the Spurs, a silver medal at the FIBA World Championship 2002 and gold two years later at the Olympics in Athens. Manu and the rest of the Argentinian superstars who won gold at the Olympics did not play at the FIBA Americas Championship this summer since, as Olympic champions, they have already qualified for the FIBA World Championship 2006 in Japan. The time off was good, but Ginobili finds himself hungrier than ever to return to action with the Albiceleste for next year's awaited 2006 FIBA World Championship. "Having rested this summer, I can't wait to return to play with the national team," admitted the 27-year-old. "If there are no unexpected impediments, I really hope I can play in Japan in the World Championship."